I have missed this guitar so very much over the last seven months that I’ve been in Malta. 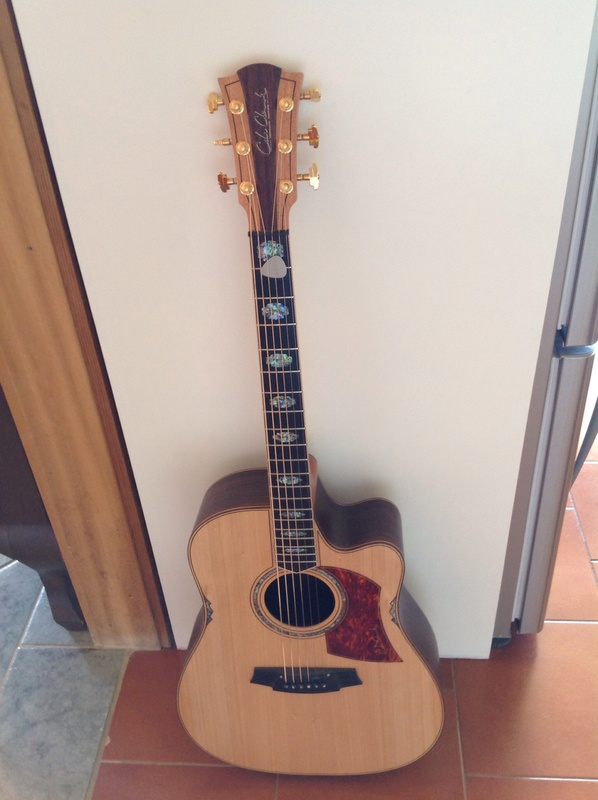 It is an Australian made, Cole Clark FL3, semi-acoustic, solid back and sides instrument and the best guitar I have ever played. It suits me just perfectly. The top is solid bunya (slightly warmer tone than spruce) and the back and sides are solid Rosewood. It has a crisp, bright, sound but great bass tones as well. The action is just a little higher than most guitarists seem to prefer. It also has a world leading amplification system which picks up signals at numerous positions in the body, resulting in the most authentic, acoustic-type, amplified sound I’ve heard. The only trouble is that she is a jealous and demanding mistress. After playing my Cole Clark FL2 in Malta since the end of April, which has a very low action, I now have to become accustomed to her all over again. It’s amazing how different the two guitars are and how you have to adjust your playing in order to get the best sound from each; after almost a week, I’m getting close. This guitar is strictly for home use only. I could never risk taking it to gigs because I couldn’t bear to see it scratched or damaged in any way; I would be devastated. My only dilemma is that I don’t want to be away from the FLA3 for so long, again. I think I’ll stay in Australia for only another three or four months before returning to Malta, so I have a problem.